The free-to-access Sky Garden, occupying the top three floors of Rafael Vinoly's 37 storey, 525ft 20 Fenchurch Street (aka the Walkie Talkie), gives diners several different dining spaces and beautiful landscaped gardens at the top of one of London's landmark buildings. Visitors to the Sky Garden will arrive by express lift at a beautiful landscaped garden at level 35 designed by award-winning landscape architects Gillespies. A bar serving champagne and canapés, a chic brasserie and viewing area can be found at level 36, and a public terrace, seafood bar and grill restaurant and cafe at level 37. The food is by "rhubarb" who also run Gallery Mess at Saatchi Gallery, "rhubarb" at the Royal Albert Hall, and Bond & Brook by "rhubarb" at Fenwick. The company also works with Michelin starred chef Heston Blumenthal and will be offering events at 20 Fenchurch Street. 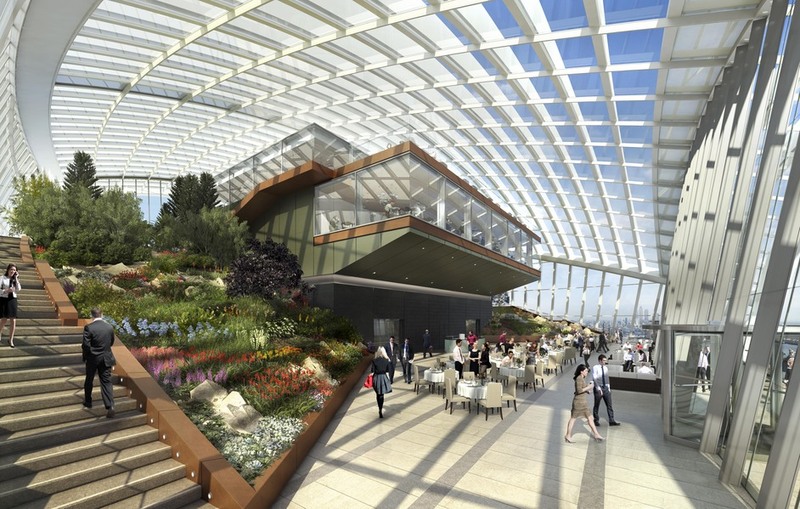 Visitors have the option to visit the Sky Garden without dining but booking must be made online at least three days in advance. Be sure to read the terms and conditions too - security restrictions include only liquids of less than 100ml and no bags larger than 8 x 17 x 19 inches. Sky Garden gyms, sporting activities, health & beauty and fitness. The best pubs near London Sky Garden. Sky Garden clubs, bars, cabaret nights, casinos and interesting nightlife. Where to have your meeting, conference, exhibition, private dining or training course near Sky Garden. From cheap budget hotels to luxury 5 star suites see our discounts for Sky Garden hotels, including Apex City of London Hotel from 89% off.